City Council formally outlaws water sport activity shortly after departure of Jetpack America. NEWPORT BEACH — The relationship between jetpack enthusiasts and Newport Beach City Hall was tenuous and turbulent, to say the least. Calmer waters seem to have prevailed – for now – for the group of waterfront residents who were anything but thrilled to see groups of thrill seekers trying to fly above water in Newport Harbor’s Turning Basin. Newport Beach’s City Council officially – and quietly – banned jetpack operations in the local harbor. The decision ends a multiyear battle between outdoor sports lovers, city leaders and waterfront residents. Council members approved the ban at their Feb. 14 meeting without discussion or deliberation – a vote later challenged by a local community activist. However the Newport Beach Harbor Commission, during its Feb. 8 meeting, reiterated its desire to have all jetpack activity banned from the city. Jetpack operations in Newport Harbor met with controversy ever since the activity was introduced within city limits. A contingency of waterfront residents opposed any jetpack activity within the harbor, claiming it was loud and unsafe. Opponents were constantly vocal at Newport Beach’s Harbor Commission and City Council meetings. Supporters of the activity said jetpack operations were actually safe and would draw tourists to Newport Beach. Opponents seemed to have momentum in early 2015 when the local Harbor Commission, in response to multiple jetpack operators offering their respective services in the harbor, recommended prohibiting all private operations of the water propelled vessel. However the City Council overruled the Harbor Commission in June 2015 and allowed one operator – Jetpack America – to continue offering its commercial services in the harbor. Jetpack America was awarded a one-year permit to operate jetpacks at the harbor’s Turning Basin; the permit expired in November 2016. The company left Newport Beach after the permit expired and was not renewed. “Now that there are no commercial or private recreational operators in Newport Harbor, staff and the Harbor Commission recommend prohibiting all water-propelled vessels that operate above the water surface in Newport Harbor,” city staff stated in a report to council members. The council’s decision to ban all jetpack operations from Newport Harbor was not consistent with free market principles, according to one resident. “The real question before you is whether or not you believe in the free market. The previous vendor had to leave the city because it was being taxed an absolutely crippling amount of money – that was abhorrent,” resident and former City Council candidate Mike Glenn told council members in an email. “Will you continue the policies of the previous council in an attempt to take the free market systems that have been proven to work, and instead allow government officials to only allow the services that a small few people do not complain about? “This is a great test of your dedication to the principals of small government,” he continued. Longtime waterfront residents Don and Judy Cole, in a joint email to the City Council, reiterated their collective opposition to jetpack operations in Newport Beach. The Coles claimed jetpack operations were not compatible with other Newport Harbor’s other uses. 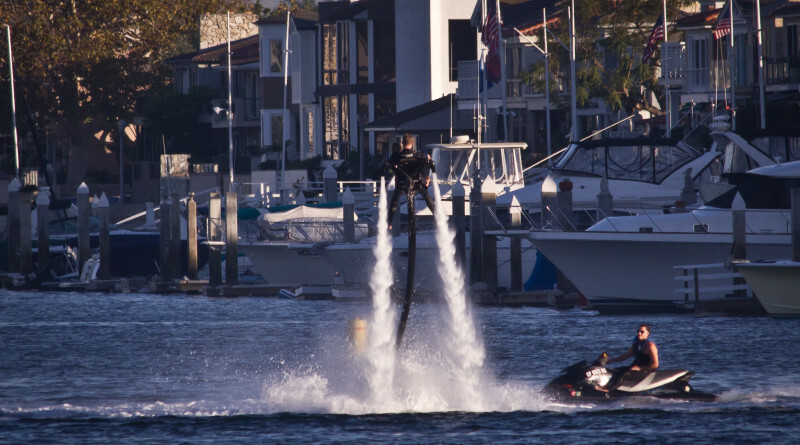 City Manager Dave Kiff said the council initially hoped jetpack operations could work as a controlled activity within Newport Harbor, but circumstances have since changed. Council members supported the ban by a 5-1 vote, with Mayor Kevin Muldoon voting against the ban proposal and Mayor Pro Tem Duffy Duffield recusing himself. The Feb. 14 vote rescinds the City Council’s June 2015 decision to allow one permitted commercial jetpack operator. The council vote was challenged a few days later. Glenn, according to news reports, filed a complaint against Council member and former harbor commissioner Brad Avery. The complaint reportedly alleges Avery had conflict of interest and therefore the vote should not be allowed. Glenn explained the allegation on a blog he manages. “When Avery ran for office, he put down his main occupation as the job he has working as the director for [Orange Coast College’s] marine programs,” Glenn wrote on his Save Newport blog. “Out of this area, he runs sailing classes, sends people out on sailing boats, and also runs an organization on the side, which sells boats. Finally, he has been the head honcho of a prestigious yacht club right here in Newport Beach. “Note that none of this involves jetpacks – only ‘traditional’ boats and boating – two water uses which compete for the same space, and only one of which Avery gets paid to operate. So what were the jetpacks ‘incompatible’ with? Could it be the same types of business that Avery makes income from?” Avery continued. Jetpack America is still operating in San Diego and Las Vegas. Thank God! Now, for some logical controls on SUPs, Kayaks, etc., along with those small sailboats whose operators think they own the harbors and believe they have absolute right-a-way and no responsibility for causing an accident. Most are apparently operated by clueless renters. Many times the SUPs line up side-by-side and are strung out across the whole harbor, interfering with navigation. The small sailboats rip back and forth from one side of the harbor to the other with total disregard for powered traffic. It isn’t easy to watch every direction for these fast moving sailboats, nor SUPs that come out of nowhere. Fortunately, the courts have determined that “common sense” has to apply, and these human and wind powered craft operators are now being held responsible for their negligent actions. Now, lets hold the rental companies equally responsible. Wayne, while I agree with your premise that the sailboats can be a problem, they do have the right of way.